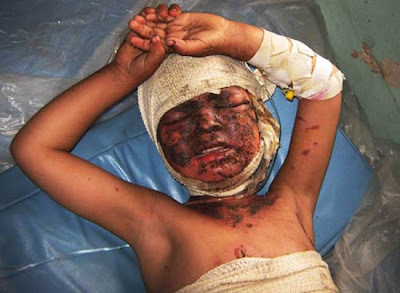 * No, this is not a photo from Hiroshima, it is from Afghanistan. The "good" war. What we are seeing in Afghanistan is horrific. What I feel are the most egregious humanitarian sins involve the displacement of entire communities. There is a certain resignation to the deaths that occur in times of warfare, but when an entire social network disappears overnight, a network that took generations of cherishing to build, hone and develop, one has to ask what the eff we are doing? The net effect is little less than what happened during the Armenian and Nazi holocausts of the last century, but I doubt I would be permitted to say so explicitly in my reporting, given that Petraeus and Holbrook will almost certainly see it before it becomes public. To me the tragedy of Afghanistan is less about deaths under bombing than it is about destruction of a society. * Early this morning I drove an hour northwest to Winthrop, Maine to join Veterans for Peace member Tom Sturtevant in speaking to his local peace group about our recent trip to South Korea for the Global Network annual space organizing conference. 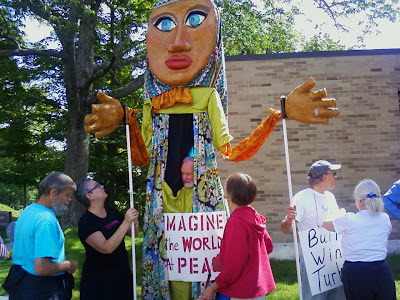 The Winthrop-Wayne People for Peace had a strawberry breakfast at a local church (it's strawberry season in Maine). Tom is a retired school teacher and was in the Navy during the Korean War. He worked on the flight deck of aircraft carriers just off the Korean coast and witnessed a never ending bombing campaign that destroyed virtually every building in North Korea during that war. His heart still suffers today from the experience. He is a genuine top-notch peace worker. * I am reading a book now called "Unbroken Spirits" by Suh Sung, a Korean activist who lives in Japan and spent nineteen years in South Korean jails from 1971-1990. Suh Sung came to our Global Network conference last April and gave me the book and I've just now had a chance to read it. It is a remarkable story of a courageous man who survived endless physical torture and mental abuse as a penalty for just wanting to see his country reunified. He recounts how the South Korean government and security forces were led by Koreans who had collaborated with the fascist Japanese occupation of their country. Suh Sung today lives in Kyoto, Japan where he teaches and I hope to be able to see him when I visit there at the end of this month. See the Italian police in action as they beat back protesters in Vicenza on July 4. These activists don't want an expanded US military base in their community and have adopted the Obama slogan - Yes we can! Suddenly, those protesting for their democratic rights of self determination, are not so noble (or useful) to US officials when the source of their consternation is the US military empire. Say No to the global war machine. Convert it to peaceful and sustainable production. Veterans from Iraq and Afghanistan wars tell their stories. They need to be heard. So while we fight the Taliban in Afghanistan and Pakistan the US has also put "Taliban light" into power in the Afghanistan government. The peace movement must begin to understand more about the layers of deception now underway in US policy in this part of the world. I remain convinced that the war in Afghanistan has virtually nothing to do with the Taliban or democracy. It should be remembered that the Taliban where brought to Texas to meet with UnoCal oil executives a couple years before 9-11 happened. They were basically told: Let us build pipelines through Afghanistan and we will provide you with a carpet of gold, if you don't allow us to do this you will get instead a carpet of bombs. They turned the deal down and 9-11 happens and we begin bombing Afghanistan and eight years later Obama expands the war. After Afghanistan was invaded, a new leader was put up: Hamid Karzai. He was former adviser to UnoCal. Some years ago I went to the Congressional Record web site and found testimony of oil executives pleading with Congress to help put a more compliant government into Afghanistan that would work with the oil corporations. "A commercial corridor, a 'new' Silk Road, can link the Central Asia supply with the demand -- once again making Central Asia the crossroads between Europe and Asia," UnoCal told Congress. As the author Ahmed Rashid has documented, the US oil company Unocal has been seeking since 1995 to build oil and gas pipelines from Turkmenistan, through Afghanistan and into Pakistani ports on the Arabian Sea. The company’s scheme required a single administration in Afghanistan, which would guarantee safe passage for its goods. Joe Biden is the man who went to Georgia, immediately after their hot war last summer with Russia, to pledge the US's unyielding loyalty to them. This was even before he became Obama's pick for VP. Biden has always been a hard-liner and this kind of talk about not objecting to Israel bombing Iran is just beyond dangerous. I ask this simple question: What is the difference between Biden giving this green light to bomb Iran and John McCain famously singing "Bomb, bomb, bomb, bomb, bomb Iran"? * It's still raining outside. In truth we had three fairly lovely days in a row so I can't complain too much. The garden appreciated the sunny interlude. The entrance to our driveway has partially washed out though and I had to order some gravel today to fill it in. We had two more cords of wood delivered yesterday, for next year, so it will just sit in a big pile until next spring when I will stack it. It's not cheap living in this world. * I've finished my speeches for Japan after four solid weeks of work on them. Several friends gave good advice and I did about four drafts before the final versions. The schedule for the trip is filling up with stops planned for Tokyo, Nagoya, Kyoto, Hiroshima, Nagasaki, Fukuoka, and Seoul, South Korea. I will be in Japan for three weeks and Korea for one week. Should be a wonderful trip. * The reviews from the Obama-Medvedev summit are still coming in and virtually all are saying the same thing - a disappointment with no serious disarmament planned. * Tonight I drive south for an appearance on a public access cable TV program called Out in Left Field produced by my friend Richard Rhames. Richard is a vegetable farmer in Biddeford and a long-time activist in Maine and one of my favorite people in the state. He is a real character who tells it just like he sees it with no frosting on top of the cake. He is always fun to be around, even when we are discussing the most depressing subjects. He's got a fine intellect and an even better sense of humor - that real dry Maine variety. Richard runs the camera and two wonderful guys, Tom Kircher and Matt Hight, do the interviewing and always make it a special experience. These guys get the best out of me and I love them all. * I'll miss our weekly radio show tonight at the Bowdoin College station that I co-host with friend Peter Woodruff. The show is called TRUE - Truth Radio Underground Experience and we do it every Wednesday night from 6-8 pm (EST). I'll be back on next week with Peter but will then miss a month of shows due to my upcoming trip. We play political music and talk about what is in the news. You can listen to the show via the Internet by clicking here and then hitting the yellow button at the top. * I take the call to "create our own media" seriously. I also have my regular cable TV show which is now in the sixth year of production. You can see past shows by clicking on the TV just below on this page. I try to do a new show twice a month but sometimes that is not possible with all the traveling. I've just scheduled another edition of the show, called This Issue, for July 20 and will interview Lisa Savage from CodePink in Maine. We are going to talk about Afghanistan war organizing in our state. Lisa has taken leadership of our efforts to get the peace movement working together across the state on Afghanistan and she is doing a great job. * The cartoons above are by another CodePink friend, Anne Gibbons from New York City. She is very good and I love how she regularly weaves good politics into her syndicated cartoon. There are some good voices being heard out there! Last night I turned on CBS TV news to see what they were saying about the Obama-Medvedev summit on reducing nuclear weapons. The first ten-minutes of the show was about the coming funeral and memorial service for Michael Jackson and the legions of people who tried to get tickets to the memorial that will be held inside a basketball arena. Finally the story came and went about the nuclear negotiations. Not much to it. The current START-1 treaty between the US and Russia expires on December 5. Obama and Medvedev agreed in principal to cut deployed nuclear warheads from current levels to somewhere around 1,500-1,675 each. Still more than enough to bounce the rubble after a nuclear exchange. According to an analysis piece posted by the Reuters news agency, the cuts announced on Monday only take the US and Russia 25 operationally deployed warheads below a range of 1,700-2,200, which both sides had previously committed to reach by 2012. So modest is indeed the watch word here to describe this new deal. Both sides are still working out what exactly constitutes a nuclear weapon and the whole "missile defense" ghost still remains in the room. The two leaders were also unable to resolve the contentious issue over reductions in missile launchers and bombers. 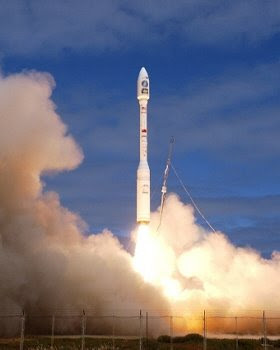 The Washington Post reported that "The Russian military is worried that the launchers and bombers could be used to quickly rebuild the US nuclear arsenal and would pose a threat to Russian forces even if armed with non-nuclear warheads [the prompt global strike system that the Pentagon has been talking about lately]." I listened to the whole news conference yesterday that Obama and Medvedev held to outline their agreements. In the end this deal does not show the world that the US and Russia have made a serious commitment to get rid of their nuclear weapons thus setting an example for others to follow. If they think that states like Iran, India, Pakistan, Israel, or North Korea are going to be moved to shut down their nuclear programs, while the US and Russia maintain 1,500 or more nuclear warheads then they are indeed wrong. There doesn't appear to be an understanding on either side that "Global Zero" does not mean a couple thousand nukes. Sadly the military industrial complex in both countries still can't bear to give up their nuclear security blanket. They will though likely continue to press others to do what they are so far unwilling to do - and that is to honor the UN's Nuclear Non-Proliferation Treaty (NPT) which calls on all nuclear powers to disarm now. Bob Anderson from Albuquerque, NM sent me this story this morning. So the Unmanned Aerial Vehicles (UAV's) are not only being flown from Nevada but New Mexico as well. There is talk of trying to establish a UAV test range here in Brunswick, Maine when the Naval air station closes down next year. This drone killing machine is the Pentagon's answer to escalating war costs and difficulty with recruiting. The use of unmanned drones as weapons of war in conflicts around the world has been called into question by one of Britain's most senior judges. Lord Bingham, until last year the senior law lord, said that some weapons were so "cruel as to be beyond the pale of human tolerance". Latest report from Cynthia McKinney and others who were put in jail by Israel for trying to bring humitarian aid into the demolished Gaza strip. Here we are preparing to start yesterday's parade in Bath. It was a joy and we all were still talking about the experience last night. It's pretty empowering when you consider the impact you can have in front of 10,000 people if you just put in some effort to be creative and coordinate your message. The reports from people behind the puppet, who were holding signs, is that people in the crowd were saying, "Yeah, we want to build wind turbines in Bath." Six years of talking about conversion is beginning to turn the ship.